Simone has lived in Reading all of her life. 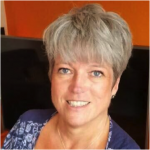 She currently chairs the Reading Physical Disability and Sensory Needs Partnership Board (PDSN), co-chairs the Thalidomide Trust’s Health and Wellbeing Committee, serves as Chair to her local Residents’ Association and has recently been writing articles for RVA as a Community Journalist. She worked for many years as a secretary at Berkshire County Council and for Blue Circle Cement, and later as an administrator for the Thalidomide Society. She has a huge variety of past voluntary experience including two years as a member of the Management Committee of Reading Community Welfare Rights Unit, founding trustee and later Chair for Disabled Parents Network, a national charity providing support to disabled people who were or who aspired to becoming parents, member of the Community Fund’s South-East Regional Awards Committee (Big Lottery), Chair of a Pre-School, School Governor, member of the Disability Living Allowance Advisory Board, Disability Living Allowance Appeals Tribunal member and member of the Maternity Services Liaison Committee. In her spare time Simone enjoys cooking, exercise, gardening and singing as part of a Rock Choir, as well as travel both in the UK and abroad. Over the past two years she’s been travelling to destinations which are a little more demanding and adventurous.